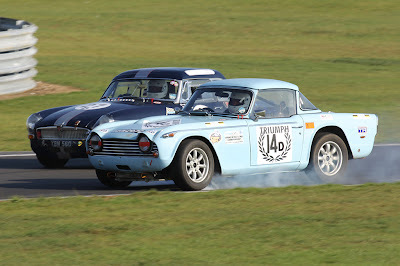 Planning for this event was taken on board by John Davies and initially consisted of 6 cars in the team. However on the day because of personal and car reasons to team members had to drop out and we started the event as a 4 car team. Apart from the cars and drivers there are other people involved including Mike and Jan May of TR3 fame (CHUG) who kindly put us up before and after the race and acted as spotters on the day. Also Alec and Diane Pringle who acted as deputy team manager to John and time keeper. 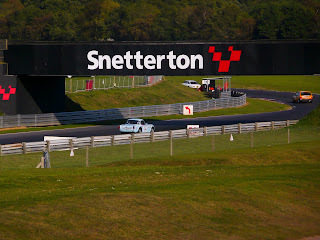 Alec has written a short report which follows but although the team suffered some mechanical maladies the TR5 soldiered on and as a result even though the team didn't do very well, I had a great time and certainly got my moneys worth, considering the number of laps I ended up doing! As the weather was hot and the stints were long dehydration became an issue and I remember having a splitting headache after my first stint of an hour and fifteen minutes, which quickly went away after drinking a gallon of water. If we accept this event as a learning curve, we will be back on October 14th 2012 to give a better showing. Put it in your diary now as spectators and helpers are always welcome. 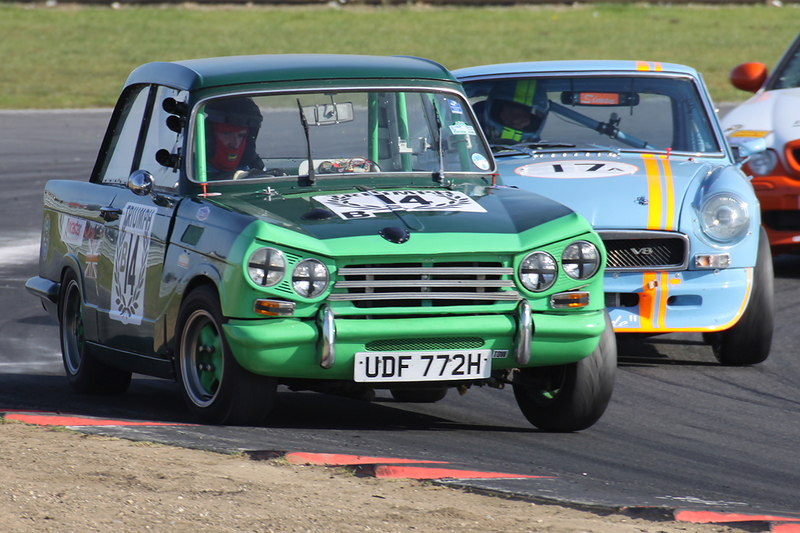 Relay races are one of those Great British Peculiarities, origins lost somewhere in the mists of club motor sport history. A team of 4 to 6 cars, mostly of a single marque, take turns to race against the clock, and against another 25-30 teams, over a duration of 4 to 6 hours. Each team car takes a stint, eventually returns to the pits and hands over the baton to the next car, and so on. 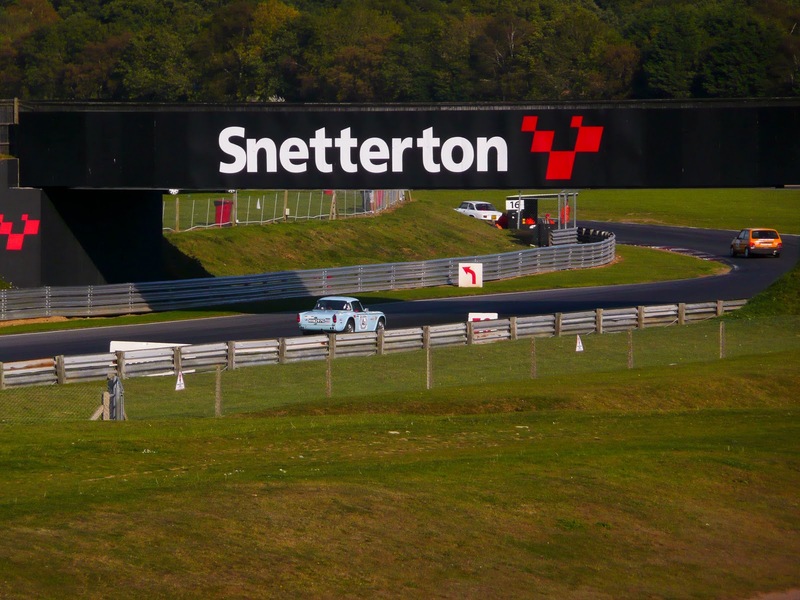 Two races in one, the first being straight distance, the second ‘on handicap’ – the fastest team starting on scratch, every other team being granted a number of ‘credit laps’. 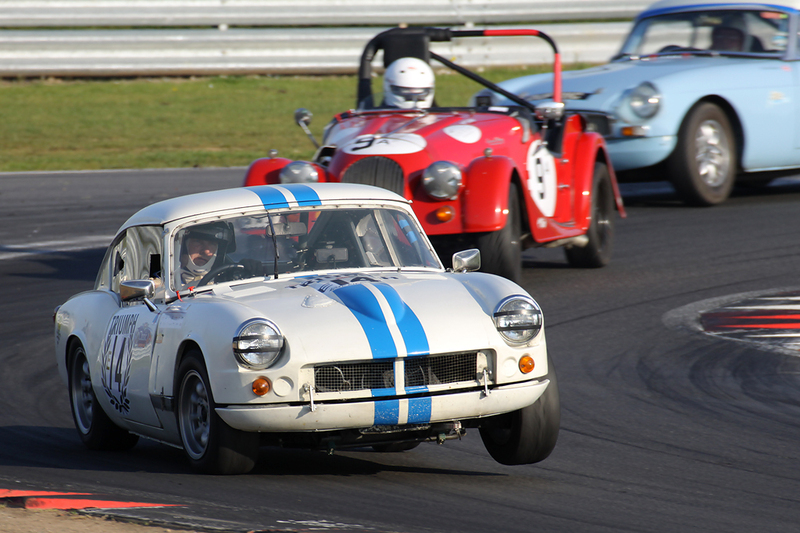 The MG Car Club held such an annual 4 Hour race at Snetterton, October 2nd, in the height of the Indian Summer. Neil Revington was invited to join the All Triumphs in his road rally TR5, alongside a brace of Spitfires, a pair of GT6s, and a lone Vitesse. Unforeseen circumstances conspired, and forced the withdrawal of a GT6 and a Spitfire, too late in the day to enable replacement, leaving just a Triumph quartet to do battle. Battle it proved to be, the overheating Spit limping in hors de combat after only a handful of laps, suspected cracked head. The GT6 flew, until terminal brake failure intervened, fortunately without injury to the driver. The Vitesse finished its first stint on a recovery trailer, broken suspension, 2 hours of work later re-entered the fray only to be sidelined yet again by electrical gremlins. Meanwhile the Revington TR5 soldiered on through 3 separate stints, the forlorn hope of the All Triumphs. It is, after all, a road rally car that enjoys a very occasional sprint or short race. It had been prepared for just the one 40 minute racing blast. In the end, Neil and the TR5 covered 81 laps, 162 racing miles, 2hrs 15 minutes on the track. 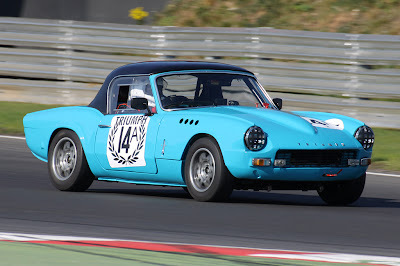 The car performed superbly, as did the driver, and with remarkable consistency – despite a differential side seal leaking under the unaccustomed stress, the TR5 finally took the chequered flag with the diff all but dry . . . . ! No team trophies to boast of this time, too much time lost to breakdowns – but a remarkable achievement to have completed the race at all, and a great credit to all at Revington TR. 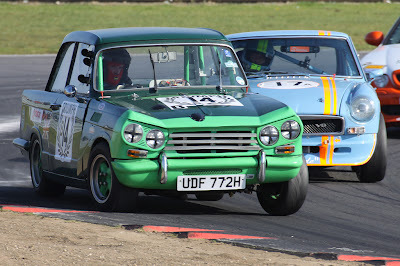 Below is an interesting video of Neil's TR5 being chased by a race prepared MG Metro. Don't switch off when the TR is overtaken by the Metro, there's more to come! Neil's TR5, being a rally car, will be heavier than most of the racing machinery, but it handles very well and it is driven better than the racing car from which the film was taken!